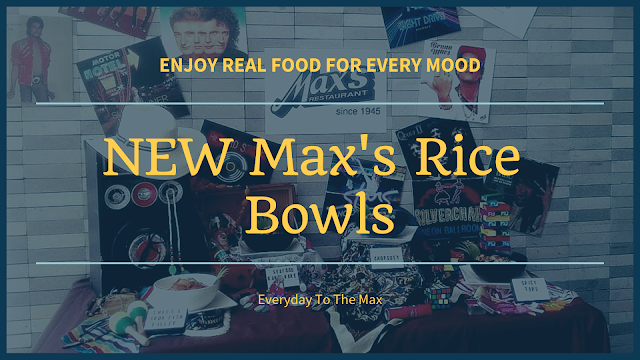 I read different reviews and endorsement of the establishment, you will surely got intrigued of this place, especially their Halo-Halo and they say that it is the best Halo-Halo in town. 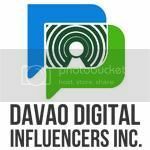 Yes, I am from Davao, but I haven't tasted it yet. The good thing, the newest mall in Davao had their grand opening last February 18 and Aling Foping's was one of the consignee who opened a kiosk at MERCADO de CENTRALE in Felcris Centrale Al Fresco, just only for 5 days(Feb.18-22), but due to public demands, the store extended its service until further notice. Since the mall is located near us, I got the chance to visit it and try Aling Foping's Halo-Halo. Halo-halo, a popular Filipino dessert with many mixtures from different kind of fruits, shaved ice and top with evaporated milk, leche flan or ice cream. 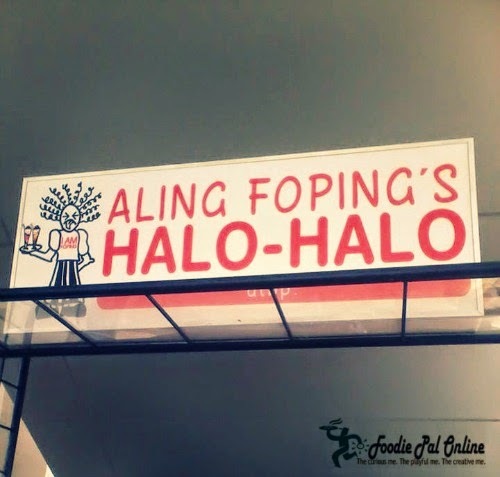 (C) Aling Foping's Halo-Halo Atbp. We went there after lunch, and people are swarming that time to get their orders. I've waited for my turn, I saw a paper and a ballpen beside the store and you need to fill it up with your order; need to create your own Halo-Halo and select 6 ingredients you like. 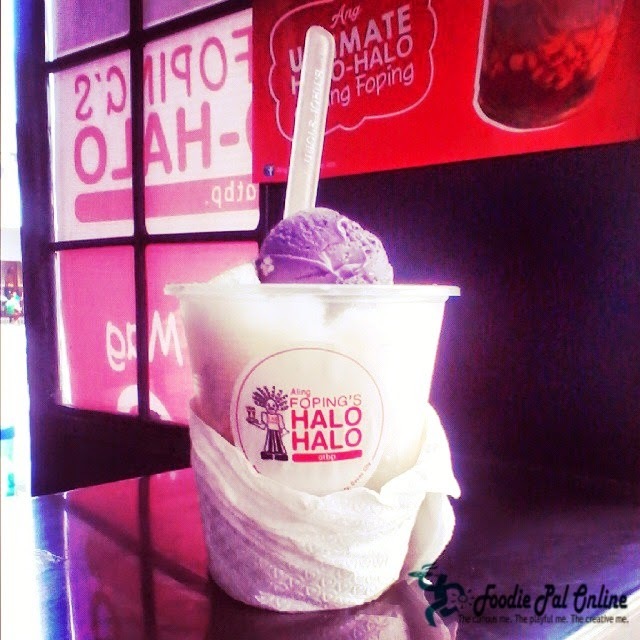 I choose Halo-Halo Special small for PHp60 only. Honestly, it is not the typed that will exceed your expectations---for the taste, it's not what I expected. It tastes good and I like it, though for me nothing compares to Razon's Halo-Halo. Maybe for us locals from Davao, we can say it is the BEST HALO-HALO in our place. 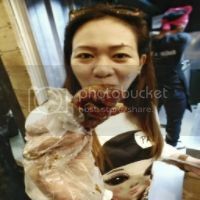 What about their Atbp food products that they served? 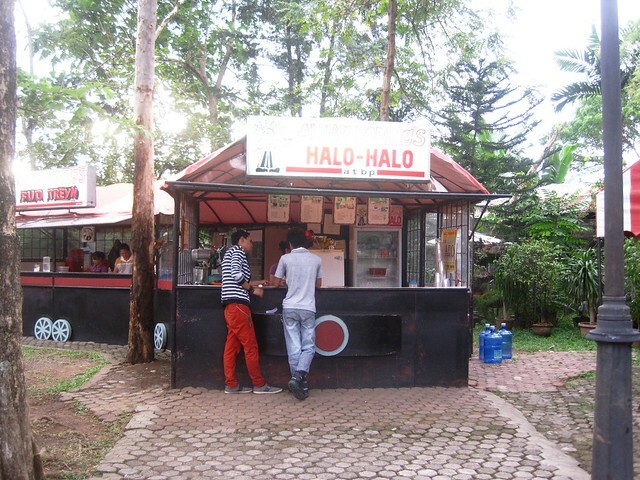 Actually, Aling Foping's Halo-Halo main branch is located at Matina Town Square. 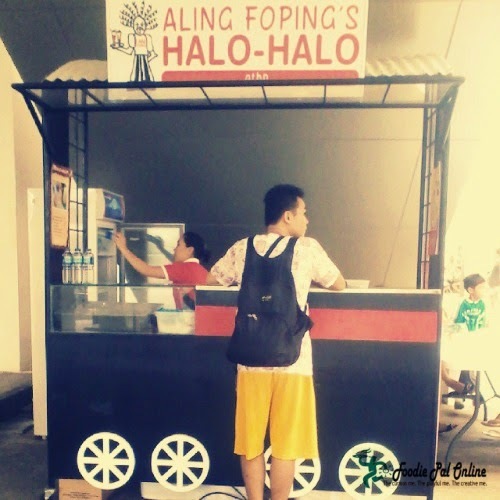 Here you can taste different foods made by Aling Foping's. And if you remember, when Kris Aquino had a TV shoot here in Davao for her show Kris TV, she takes home Chili Con Carne, as per advice by her brother, his excellency, President PNoy. They have a nice location at Matina Town Square, they have big kiosk--Aling Foping's Fud Treyn, that you can stay together with your barkadas, family and relatives. 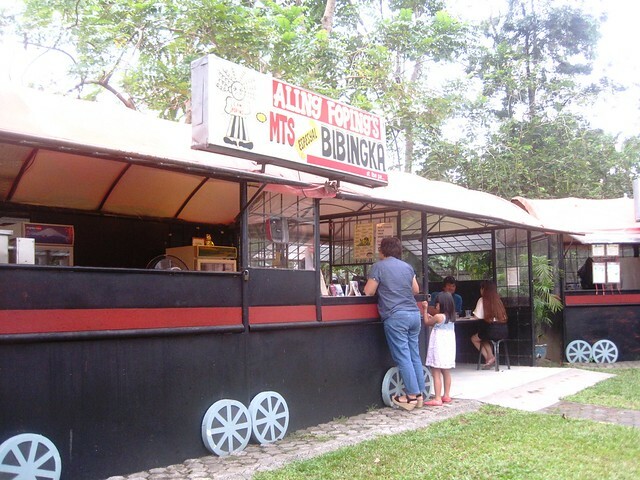 I haven't tasted their Bibingka and Chili Con Carne yet, but it's a must try food. I like the idea that you get to choose what ingredients to put into your halo-halo, but for me, it is overpriced(with limited ingredients). And if you want to add UBE and LECHE FLAN you need to pay PHp20, and pay PHp14 for the rest of the items. For foreigners who are there that time and I got acquainted with, who tried to taste the halo-halo, they said, and I quote: "It's like a "kitchen sink" type of a dessert where there were a bunch of deliciousness thrown into a cup". And I replied: "Yeah, it's true! A sink but smelled and taste good." And we all did laugh. All in all, my Aling Foping's experience with their Halo-Halo is good especially they use super fine ice. But one thing more before I forget, the staff assigned on that day is not friendly. 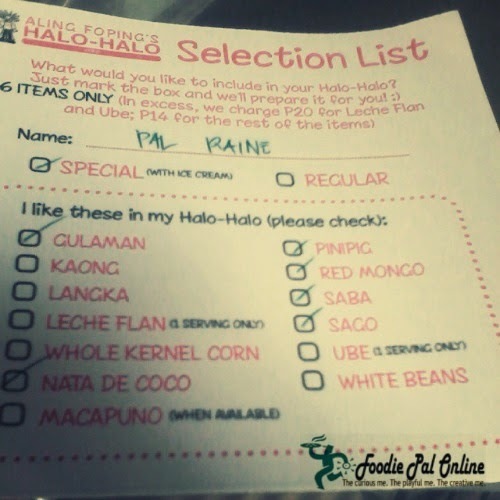 It's so cool that you get to choose the ingredients in your halo halo. Definitely a must try. Wow! kung ganyan ba lahat ng nagtitinda ng Halo-halo eh sulit ang bayad. Choose whatever ingredients you like. I haven't but I was about to explode...hahahaha...just kidding. Summer time is fast approaching and its heat is so unbearable. 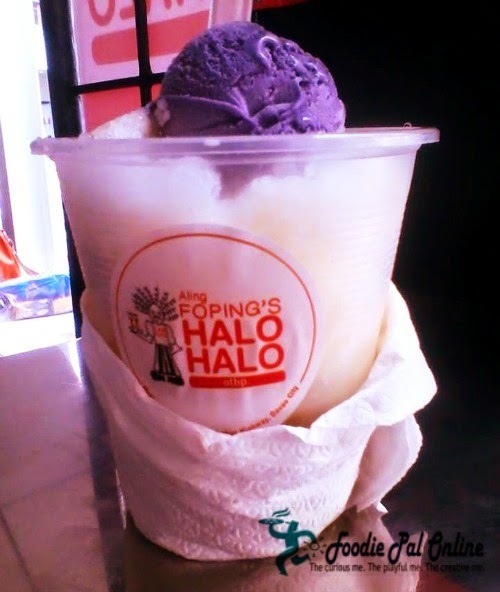 Aling Foping's halo-halo will do some cooling effect to lessen if not totally control the hotness of the season. The maldita crew has told us that it is available also at their main branch. Chili-con karne w/ bread is mouthwatering... look at those cheese!